The official trailer for Star Wars: The Last Jedi is here, and it's a lot to take in. Now that we've had some time to process every epic battle and emotional reunion (and wipe the tears from our eyes -- don't judge), we're here to break down every last minute of it. From new creatures and ships to some jaw-dropping revelations about Kylo Ren and Rey, here are the 7 biggest surprises of the Star Wars: The Last Jedi trailer. Warning: The following post contains light spoilers for Star Wars: The Last Jedi. But if you're looking to avoid those, why are you here!? The first voice you hear in the trailer is that of Supreme Leader Snoke, who says, "when I found you, I saw raw, untamed power. And beyond that, something truly special." While it's easy to assume he's talking to his protege Kylo Ren, it becomes pretty clear by the end of the trailer that he's actually talking to Rey. Snoke appears to be in awe of Rey's powers, and, judging by that terrifying Force grip he imposes on her late in the trailer, wants to turn her to the Dark Side. It's Emperor Palpatine and Luke Skywalker all over again. While Snoke is pretty jazzed about Rey's incredible Force abilities, Luke is scared as hell of them. The Jedi master tells his new student that he's "seen this raw power before," and that "it didn't scare me enough then, but it does now." Luke is clearly talking about his days of training his nephew Kylo Ren — and we all know how that ended. It appears that not even murdering his own father was enough to fully commit Kylo Ren to the dark side. The brooding Sith-wannabe (who's now maskless!) can be seen cruising around in his badass custom TIE Fighter, but when it comes time to take out his mother, General Leia, an emotional Kylo seems unable to pull the trigger. 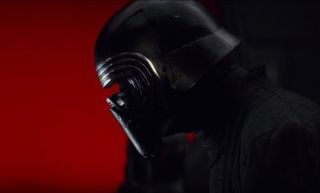 Kylo Ren's continued struggle between the Light and Dark sides of the Force will surely be a key theme of the film. In between all the fighting and crying, we get a quick glimpse at some striking new creatures native to the desolate planet of Crait. These currently unnamed beasts look like foxes with ice skin and rabbit ears, and we still haven't decided whether they're cute or terrifying. We also get an adorable moment between Chewbacca and his new porg friend. After being betrayed and left for dead by Finn, it's only natural that Captain Phasma wants some revenge. The trailer gives us a peek at an epic showdown between the two icons, both of whom are packing some powerful hand-to-hand weapons. In fact, it looks like Finn is rocking the same anti-Jedi baton that a Stormtrooper almost took him out with in The Force Awakens. One of the biggest reveals of the new trailer is that we finally see Supreme Leader Snoke in the flesh, and not as a gigantic hologram. The grotesquely wrinkly First Order leader still looks plenty powerful in his old age, as we see him take full control of Rey using his Force abilities. We've still got a ton to learn about the mysterious Supreme Leader, but it looks like he'll be a central figure in the new film. Is Rey joining the Dark Side? And then there's the big stinger. Rey says, "I need someone to show me my place in all this," only for the trailer to quickly cut to Kylo Ren reaching a hand out. We gasped. We cried. We said "what the f***." While this is likely a mashup of two separate scenes, it reinforces the trailer's overall theme of Rey's potential turn to the Dark Side. Or maybe it's the reverse, and Kylo's gesture means he's returning to the Light? Either way, seeing the new generation's two most powerful Force-wielders teaming up would be awesome. We can't wait to learn more about their mysterious connection to one another when the film hits on Dec. 15.